Recently, in a divorce and custody case in New York, a wife argued that she was under great stress caused by her soon-to-be-ex-husband. In cross-examination, the husband's attorney asked whether some of that stress might instead have been caused by a recent abortion. Allowing a woman’s abortion to be used in a custody battle, regardless of whether it occurred before or after the divorce, is an absolute new low when it comes to the idea of shaming women for choosing not to carry a pregnancy to term. The idea being presented is simple: A good mother would never seek out an abortion, so if she ends a pregnancy, she must be an unfit one. ... [T]hat’s a whole lot of women out there to be painted as “bad moms” who shouldn’t be allowed to have custody of their children. First of all, this completely erases all the women out there who are pro-life because of their past experiences with abortion. I know many post-abortive women who are also amazing moms, including many who are active in Secular Pro-Life. But setting that group of women aside, do pro-lifers believe that women who have had abortions (and don't feel bad about it) are unfit mothers? Likewise, do we assume that men who have supported a partner's abortion are bad fathers to their living kids? I can't speak for every pro-lifer, but my answer is a firm no. Most people who have abortions don't do so "in cold blood." They do so because they are coerced by partners, and/or lied to by abortion counselors and doctors who they thought they could trust. Pro-lifers should have nothing but compassion for these women. There is absolutely no reason to think that they would be unfit parents. Yes, there are a few who have/support abortions despite knowing the facts of life in the womb and having realistic alternatives. I still think they can be good parents. Never underestimate the ability of human beings to compartmentalize. I fully believe that a bank robber can shoot a teller and consider it "just business," but love his children deeply. Surely I should give post-abortive parents at least as much credit! Ideally, every parent would love all of their children unconditionally. In the case of an unapologetically pro-abortion (and not "personally pro-life") parent, there is a condition: namely, that the child's conception occur at a convenient time. But once that condition has been met and the child has been born, a parent's beliefs about the worth of the unborn are of no practical importance for the child's well-being. I'm extremely ambivalent about this article. On the one hand, it's great that you are trying to present an air of reasonableness so as not to be marginalized out of public debate. On the other hand, can it really help to respond to this kind of thing? Does it smooth things over to make an analogy between a pro-abortion parent and a bank robber who loves his children? Anyway, intuitively it seems like the people you're responding to make it their job to be offended by things. So I'm a little skeptical how much of a difference a response makes. Many of us post-abortive turned pro-lifers and open to life go to counseling, attend an abortion recovery program and sometimes have to take antidepressants for years. A "wanted pregnancy" after an abortion is extremely hard psychologically, regardless of why you had the abortion. From my experience and helping other women who had abortions, we make either detached mothers or over-protective mothers. I don't know any post-abortive mother who has a balanced relationship to her children without medical help (and spiritual help too). Either because the abortion was forced and deep down, she lives in fear that someone is going to take her kids away from her (over protective mother) or she has compartmentalized like you said (detached mother.) It doesn't mean we are bad women, it means that abortion is destructive at more than one level and that we need help. (by the way I do not approve of the divorce lawyer using abortion against the woman. Such a low blow especially since we don't know the circumstances and how much the husband was involved in this abortion or in another woman's abortion). This is helpful insight. Thanks. "there is a condition: namely, that the child's conception occur at a convenient time." There is also another condition--that no "unexpected" developments and/or news occur during the next several months while abortion is still legal. For instance, if someone conceives on purpose and then loses a huge amount of money in an economic downturn, then this could change the calculation in regards to whether or not this parent will abort her prenatal offspring. I am in disagreement with conclusion of this article. Imagine a woman who gets pregnant through her own irresponsibility, and wanting to rid herself of what she views as the inconvenience of pregnancy, has an abortion, and does so without any negative feelings. Can such a woman be a good mother? That is, can a mother that is fully cognizant of the vulnerable life growing within her, a life that depends on her for nourishment and protection, and then eliminates that life because of...what....its inconvenience, its embarrassment to her, be a good mother? Absolutely not. To such a "mother," love, respect, and concern are not things that should be unconditionally given to a child. 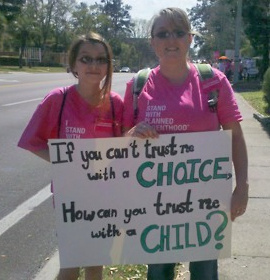 They are predicated on other factors, determined by the mother, that the mother chooses over the life of her child. It is surely a cold, cruel calculus that can dispose of an unwanted life, knowing full well the preciousness of that life. So basically, love of a child comes down to convenience, and that is hardly genuine love at all. It is the most appalling debasement of any semblance of love and moral consistency and integrity. Any child born to such a woman is living with a dangerous mother indeed. And what about inconveniences that arise after birth? Perhaps the child isn't as good-looking or intelligent as the mother had hoped. Can she now put her past behind her and embrace life for its sheer value? Possibly, yes, but her history is not an encouraging guide. This is a really interesting post. I think it goes along with the common misconception that we think women that have had abortions are terrible or that women with pro-choice leanings have no respect for life in general. I'm of the opinion that a few people have created an idea that society has generally accepted. Surely not all slave owners were terrible people. The act was wrong, but as a societal institution people just went along with it. We can't judge the women who have had abortions or are pro-choice. The best we can do is be compassionate and hope to change public opinions. And you act like all abortions are the result of a woman being manipulated and deceived by trusted doctors. Show me the statistics on that one. Many intelligent women are fully capable of having abortions of their free will, based on their own considerations, and are not duped into the procedure. Give women the intelligence and credit they deserve for making a decision to kill a child. Certainly, women who have had abortions can be good parents to their born children. But are they good parents in general? If a mom showered love and compassion on her oldest child, and then hired someone to kill her youngest (born) child because he or she was a disappointment to her in some way, would you call her a good mother? Such a mother should have all the compassion, love, understanding, counseling, and forgiveness in the world - but her dead child - the true victim - deserves justice. It is difficult to articulate a balance here because abortion is legal, and we are constantly told that it is "no big deal" and "a woman's right", so I believe that women, and abortionists, today cannot be held accountable in the same way that they should be held accountable for the murder of born children. But does that change their actions in any objective way? I don't think so. I have to say I do agree with the main point of this article. Are racists bad parents to white children? Are homophobes bad parents to straight children? (Aside from the fact that they'll probably pass along those attitudes.) Then I don't think it makes sense to say that pro-choice people are bad parents to born children. 100% of agreement with this blog entry. The attorney's intention was, at least for me, quite clear (not to mention dishonest): to present the woman as an unfit mother because she had an abortion. Aside from the well-known mysoginistic view that abortion and child-bearing are both women's exclusive reponsibility, even if the question were related to a procudre different from an abortion, this is a typical fallacy of composition: if a person does something bad, then he or she must surely be a bad person. If a woman or a couple has an abortion, then they certainly cannot be good parents to their living children, right? Even many of the worst criminals can nevertheless feel the utmost love for their families and care for their children. Their unjustifiable crimes do not exclude their being capable of loving their children. I cannot, in good conscience, admit this truth and still deny post-abortive parent's love for their other children, specially considering how many of these parents or single moms are often misled by the same counselors and healthcare professionals whom they trust and turn to for good advice. Even those people who choose to have an abortion despite being well-aware about prenatal development and what an abortion actually is, and despite having plenty available alternatives, are not necessarily bad parents to their living children. And I wonder just how many self-proclaimed "prolifers" would dare saying to former abortion advocates and current prolife activists, many of whom are post-abortive parents themselves, that a single bad decision in their lives makes them bad persons and bad parents as well. Condemning abortion, that is one thing; condemning a person as a whole because they made a bad decision (and without us knowing the exact circumstances that led them into doing so), that is a very different thing. I am against abortion without any exceptions and I am committed for life to fight against it and see it abolished for good, but I will never ever dare label someone as a bad person or a bad parent because of a bad decision, or deny them of their chance to make amends. Definitely agree with the latter paragraph! But it's not about convincing the already-convinced, it's about showing people *who are more on the fence* what it is we stand for. It sounds like you are severely unaware of the many post-abortive women who have happy families. They do exist. Their disregard for the life of a child in the womb isn't extended to children born. This isn't a choice on their part, it's a natural feeling. They sincerely love their born children and would do anything for them just like a pro-life woman would. Even women who are aware that it is a life inside them-- they often don't see it as valuable because of its limited development. In contrast, they see their infant as highly valuable because of its development level and any subsequent development levels are of equal or higher value. Again, it's not an articulated choice, its just how they feel. A born child that becomes inconvenient is still far too valuable to even consider disposing of at such a developmental level. Like they'd be repulsed at such a thought. Have you ever known a woman who has had an abortion and either has chidlren already or went on to have other children? "Does it smooth things over to make an analogy between a pro-abortion parent and a bank robber who loves his children?" I was really digging the article until it got to that part. To me, it read as, "You can be a sociopath/bad person and still be a good parent." THIS WEEKEND: National Community Baby Shower! Europe Rejects "Human Right to Abortion"